The majority of people still don’t understand information architecture and the value that it brings to Web sites and other information-technology experiences. The title of this column could have been “Getting Your Information Architecture Right.” But, to be honest, my guess is that the majority of people still don’t understand information architecture and the value that it brings to Web sites and other information-technology experiences. Uttering the term information architecture when speaking to a sophisticated business person or even an intelligent lay person typically leads to raised eyebrows and a tilted head—that is, an expression of perplexity—or perhaps curiosity. While information architecture, as a term, sounds impressive, it consists of two concepts that can be difficult to grasp—even for IA practitioners and academics. Even though the average person deals with many forms of information every day, people’s popular view of information is as an abstract idea that applies to just about anything. Anything can be information. As for the term architecture, it’s equally troublesome. In preparation for writing this column, I recently polled ten people, asking them what came to mind when they heard the term architecture. Figure 1 shows the results of my informal survey. It provides a hint about what may be going through the minds of people when they hear architecture—and most likely when they hear information architecture, too. For practitioners of contemporary information architecture, this list provides a good foundation for conversation. Contemporary information architecture finds inspiration from traditional building architecture. But conversing about information architecture in this way often leads to a description of many different things—similar to the results in Figure 1—and sometimes comes off as being incredibly broad, esoteric, or philosophical. On the other hand, for practitioners of classic information architecture like myself, who develop their perspectives around the concept of information—more than architecture—the results of Figure 1 are troubling. Explanations of information architecture by classic practitioners often become technical or theoretical and don’t connect with people’s expectation of the word architecture. Because the range of topics that these two popular perspectives of IA practice cover is broad and inconsistent, the value of information architecture is difficult for many to grasp. Fortunately, as with any range, the broad subject matter of information architecture has a center—and it resonates with undeniable value. Irrespective of one’s school of IA practice—contemporary or classic—what information architecture exclusively produces is a sound site structure. Site structure is not only a necessary topic for discussion; it’s the best topic for consistently communicating what is possibly the most important aspect of information architecture to a wider audience. For the remainder of this column, I’ll explain why site structure is both a necessary and more accessible term to use when you’re explaining information architecture to stakeholders and peers. I’ll then demonstrate how to identify and articulate site structure as part of IA practice. By focusing on site structure to make information architecture more accessible, we can drastically simplify how stakeholders and our peers understand the contribution of information architecture. In the second part of my survey, I polled the same group of people to discover what they thought of when they heard the term structure. After tabulating the results, it became clear that there is a greater shared sense of this word. In Figure 2, the majority of the survey participants related structure to organization and order. While a significant number thought of building, I posit that they were thinking of buildings as prime cultural examples of applied organization and order. From the survey, structure appears to resonate with greater consistency in terms of its implied meaning. 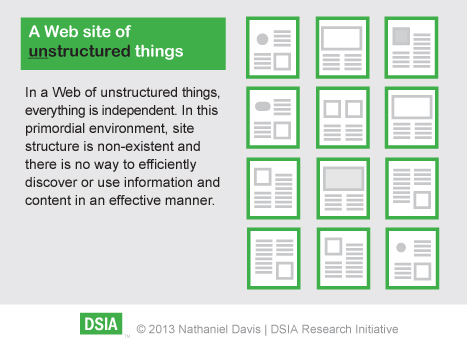 Also, this meaning of structure correlates well with the idea of information architecture, as we’ll see later on. As a result, by focusing on site structure to make information architecture more accessible, we can drastically simplify how stakeholders and our peers understand the contribution of information architecture. For example, in context to the Web, when we refer to the term site structure, people’s understanding what site means goes without saying. That leaves us only having to explain what we mean by structure. Fortunately, as Table 2 shows, we can infer that, because people understand the importance of structure for built artifacts like bridges and buildings, we simply need to demonstrate what structure means in relation to Web sites or other digital, information-technology experiences. So, let’s talk structure. 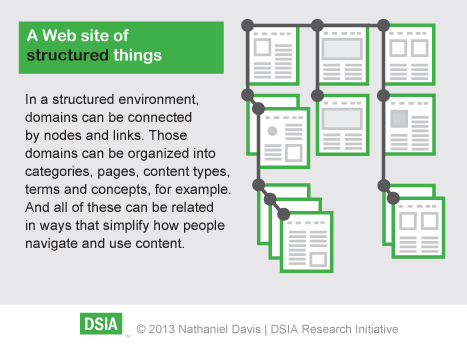 Site structure embodies order and organization for content on the Web. My survey supports the idea that site structure embodies order and organization for content on the Web. Even though my research was based on a very small sample group, I think the survey results are spot on. Here’s why. Several core disciplines contribute to the user experience of Web sites. For example, visual design offers aesthetics and affordances; interaction design governs interactions with digital objects; content may comprise text, graphics, audio, and video; and information technology enables the functionality that allows users to experience all of these forms of communication in a digital context. But, without site structure, every page in a Web environment would be an island unto itself; an individual page of digital objects, as Figure 3 illustrates. However, to move beyond a single page to create coherent digital spaces or places through interaction with information, a site must have structure. This is the value that information architecture provides, as Figure 4 shows. While Figure 4 illustrates a structure comprising page relationships, it could easily represent and include the structure between a set of components on a page or a taxonomy of related terms and more. In short, as soon as you create any type of abstract relationship—between pages, content objects, or concepts—and a way to physically exercise those relationships—typically through methods of navigation or some other interaction with information—you create a site structure. These key elements also reflect the concepts of organization and order that surfaced in the survey. Increased site-content volume—from either an organization’s content owners or user-generated content—volatility in site usage, or a growing user base are some good reasons to reconsider who architects and manages your site structure. Most people who create site structures are not trained practitioners of information architecture. Our natural human capacity to organize and relate things gives many people who aren’t IA professionals basic, but useful site structuring skills. But don’t be fooled. Creating and maintaining a site structure can be highly complex. Since complexity tends to increase in an active domain, know when to call in an expert such as an information architect. Increased site-content volume—from either an organization’s content owners or user-generated content—volatility in site usage, or a growing user base are some good reasons to reconsider who architects and manages your site structure. Web sites require sound structure—at many different levels—to hold them together. Without collectively considering navigation, information organization, and information relationship strategies for your site, you’re likely to have an unstable site structure. To understand the state of your site structure, seek an independent assessment of your information architecture on a periodic basis. Lastly, a Web site may have well-designed pages with engaging interactions and relevant content, but to maximize the site’s dynamic potential—and go beyond a loose collection of isolated pages and content—you need a sound site structure. Creating such a site structure means taking into account the properties and relationships of content in ways that support sustainable and flexible use. Information architecture is both the practice of and the solution for getting Web site structure right. Nice introduction, Nathaniel. Getting the structure right is something clients and designers take for granted. The big culprit: they look for structure in the content only. That is only one part of structure, but the other more important part is looking for structure in user tasks. Hi Nathaniel. I truly appreciate this article that you introduce. You display a clear structure and definition equally for readers that are either new or well seasoned in the field of information architecture and design. I think that is what distinguishes a good article from a great one! I appreciated this article so much that I had to share it with my readership. 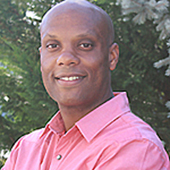 Thanks for keeping up evangelizing the value and position of information architecture.